A Camarillo fire crew cuts defensible fire lines at the Nunn Fire in 2017. Fire lines help in preventing the spread of wildfires by containing the fire within the parameters of the fire line. Located in Camarillo, California in Ventura County between Santa Barbara and Los Angeles, the Camarillo Center is a state-of-the-art Silver Leadership in Environmental Efficiency Design (LEED) building with drought tolerant and California native plant landscaping. The center is located in the middle of a farm area and is home to about 80 Corpsmembers and staff. The climate in Camarillo is mild all year-round with the beaches of Ventura County just a few miles away. Those interested in becoming a Corpsmember at the Camarillo Center are encouraged to visit the center for an orientation and tour on the first and third Tuesday of every month at 3:30 p.m.
Corpsmembers learn the importance of teamwork, both on the field and at the center. The Camarillo Center recreation staff coordinate trips to local stores, movies, parks, basketball games, beaches, and many other exciting, entertaining events and locations within Camarillo and nearby cities Ventura and Oxnard. The center has a very active Corpsmember Advisory Board (CAB). CAB Corpsmembers lend a hand in the planning and logistics of activities. The Camarillo Center is not far from a number of locations in the greater Los Angeles area including Disneyland, Magic Mountain, Universal Studios, Beverly Hills, and other popular tourist spots. There is a recreation room onsite with pool tables, ping pong, foosball, and other games. A 24-hour laundry room is available for Corpsmembers to clean their clothes so they are ready to leave on short notice to an emergency. There is a natural running track circling the property, an outdoor basketball court, a field for soccer, a weight room, and a cardiovascular room. The modern kitchen is equipped with high quality preparation tools, knives, and more for cooking and baking. The large dining room is next to a multipurpose room that can be used for indoor basketball games, graduations, and holiday banquets. Corpsmembers are required to serve 48 hours of volunteer service during their year to be eligible for a scholarship. There are many non-profit organizations that need volunteers and local cities often have large-scale events that depend on volunteers for their success. Corpsmembers can also create their own volunteer project and submit it for approval. Corpsmembers at the Camarillo Center are hired to construct boardwalks in areas that are difficult to walk on to make these areas more accessible to everyone. The boardwalk pictured is located at Carpinteria State Beach and gives people in wheelchairs the opportunity to travel over large sand dunes to access the beach. Corpsmembers participate in a variety of conservation work projects. The projects are sponsored by federal, state, county, and city agencies as well as nonprofit organizations. Typical partnering agencies include the California State Parks; Los Angeles, Ventura and Santa Barbara counties; California Department of Fish and Wildlife; California Department of Transportation (Caltrans); the National Park Service; and various other environmentally related organizations. Wildland Firefighting: Under the command of CAL FIRE, CAM 21, CAM 22, and CAM 23 fire crews are dispatched to fires across the state. These skilled crews go through an intensive training course to prepare them to fight wildland fires. At the end of the sessions, they will have received their L 180, S 190, S 130, ICS 100, ICS 200, and ICS 700. 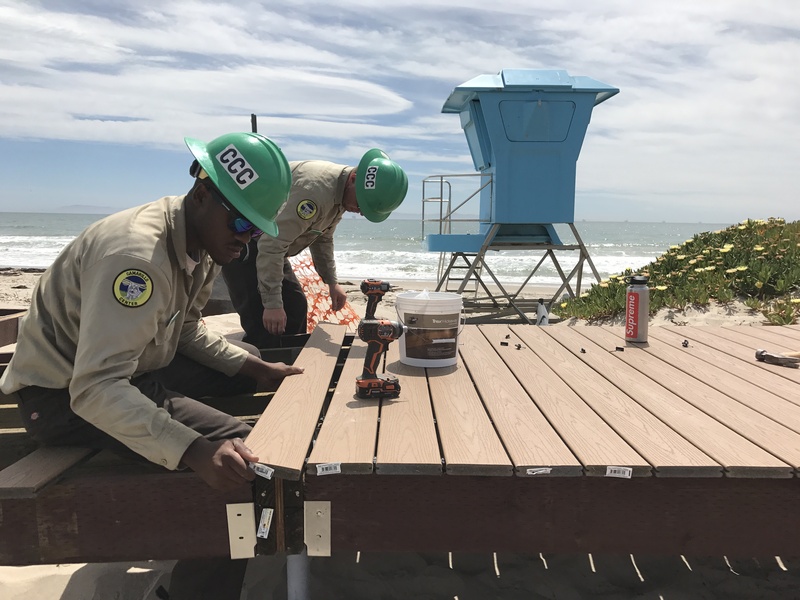 Boardwalk Construction: Corpsmembers not only learn the skills of fine carpentry, they also get the opportunity to witness how their work makes the world a better place. Crews at Camarillo have been hired to build boardwalks to make areas more accessible for everyone, including people in wheelchairs and babies in strollers. Arundo Removal: Arundo is a cane-like type of non-native plant that can grow from nine to thirty feet tall. Arundo pushes out natural plants and animals and uses up valuable water. It is highly flammable and can make wildfires worse. Corpsmembers are trained to handle and spray special environmentally friendly chemicals that kill the arundo. Steelhead Restoration Program: Crews work in creeks and surrounding watersheds using tools such as chain saws, heavy duty rock drills, and grip hoists to implement restoration projects that will long benefit fragile watersheds and threatened fish populations including the endangered southern California steelhead trout. 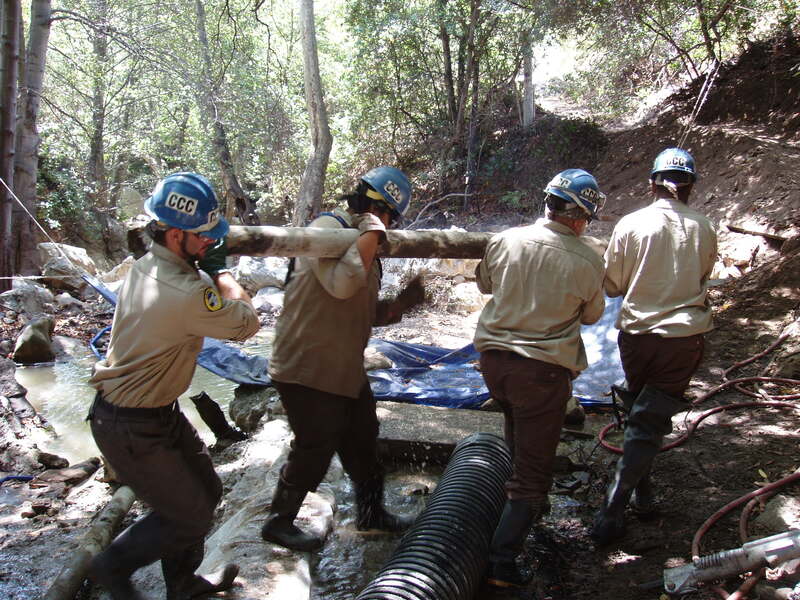 Resource Work for Various Agencies: Corpsmembers assist agencies such as the Department of Water Resources and Caltrans in their normal maintenance duties which include brush clearing, evasive weed management, and channel clearing. 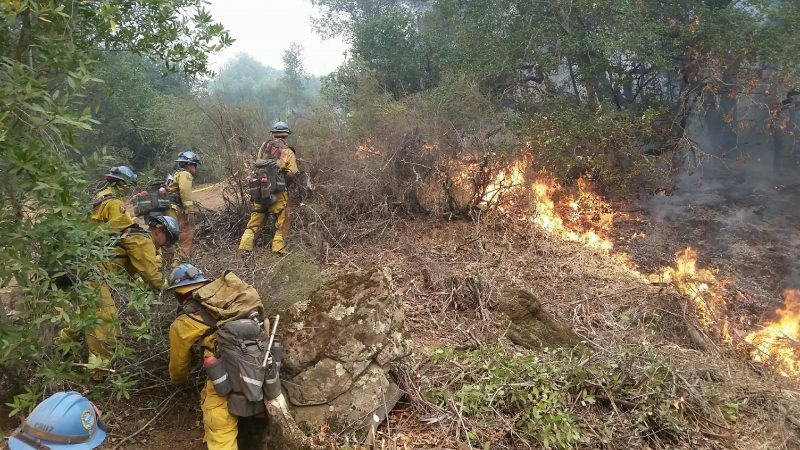 Fuel Reduction Projects: Before the fire season starts each year, Corpsmembers are out in force cutting back overgrown vegetation and creating defensible spaces in state responsibility areas. 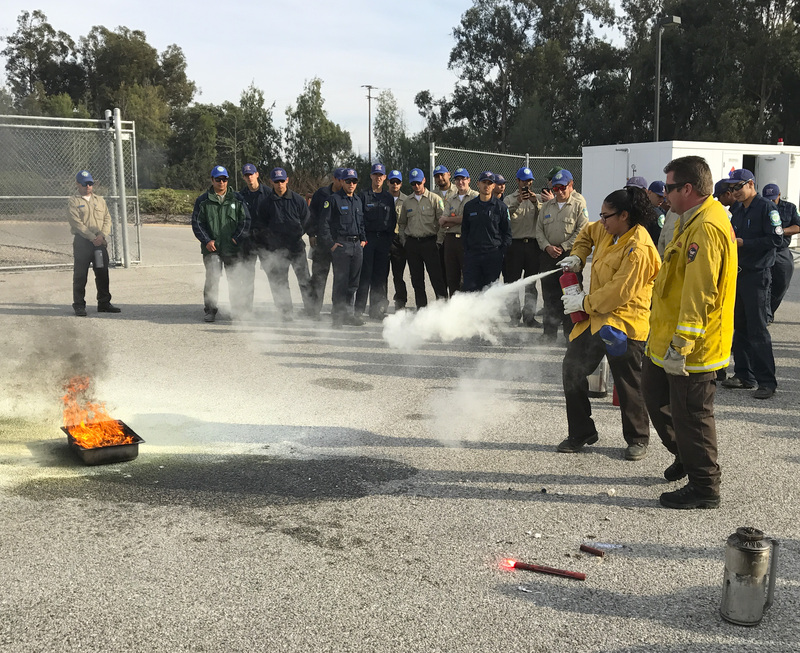 Corpsmembers at the Camarillo Center are learning how to properly use a fire extinguisher during a training offered by CAL FIRE. The Camarillo Corpsmember Development Program offers a variety of educational and training opportunities. These activities assist Corpsmembers in improving their skills, broadening their knowledge, and increasing their employability. Participation in the education program is mandatory. All Corpsmembers complete Corpsmember Orientation, Motivation, Education, and Training (COMET) when they join the Corps and complete core training courses throughout their year of service. Educational scholarship dollars can be earned as well. Corpsmembers are encouraged to take advantage of internships, promotional opportunities, leadership training, firefighting courses, drivers training/licenses, chain saw certifications, and other skill building opportunities.